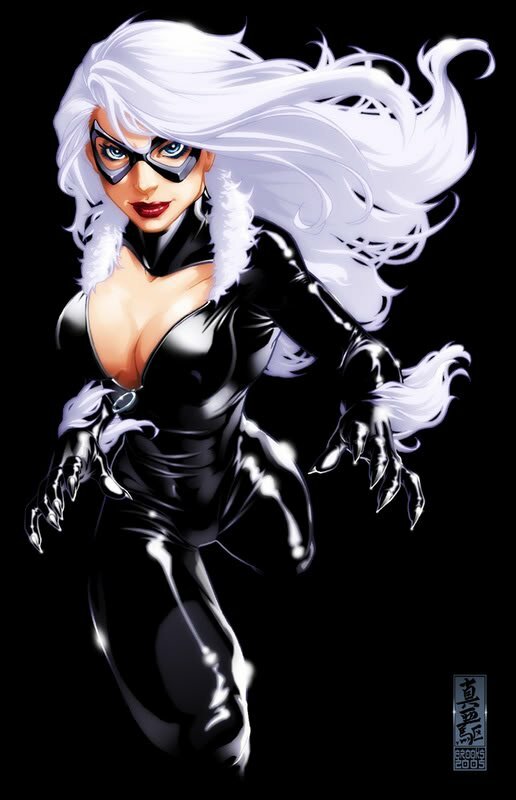 Black Cat (Felicia Hardy) is a Marvel Comics superheroine and ex-girlfriend of Spider-Man. Created by writer Marv Wolfman and artist Keith Pollard, she first appeared in The Amazing Spider-Man #194 (July 1979). The Black Cat is a skilled (somewhat reformed) cat burglar who is currently an occasional crime fighter and adventurer. Initially, her "cat-like" facade was merely a part of a powerless persona. While she later did gain powers through a combination of science and magic, her current abilities are artificial and mechanically based. The Black Cat is sometimes mistakenly considered an homage to DC's Catwoman, yet Felicia Hardy's signature low cut black costume, cat burglar profession, and steady relationship to Spider-Man, predate Selina Kyle's similar depiction in comics by almost a decade. The Black Cat has been the star and co-star of numerous miniseries and appears as a supporting character in various Spider-Man titles. Initially, the Black Cat had no superhuman abilities. She later gained the psionic ability to affect probability fields from a test induced by the Kingpin. This ability was activated through genetic alteration by scientists employed by the Kingpin. The "bad luck" power entails that under stress she is subconsciously able to cause anyone in her immediate vicinity that she perceives as a threat to be susceptible to freak accidents, like guns jamming and exploding, or tripping on objects. This ability also had the side effect of eventually causing problems for anyone spending long periods of time around her. Doctor Strange eventually tampered with her powers removing that unwanted side-effect. However, this magical tampering temporarily endowed her with cat-like abilities, giving her retractable talons in her fingertips; superhuman speed and strength, agility, and endurance, proportionate to a cat; and infrared vision and the sensory acuity of a cat. She lost these abilities after the Chameleon used a machine to suppress her powers. In the third issue of the Claws miniseries, she states that she can smell pheromones, meaning that she may still retain some animal-like sense of smell. Since Brand New Day, it has been shown that Black Cat has retained her luck powers, and has better control of them than before. i love the cosplay photos.